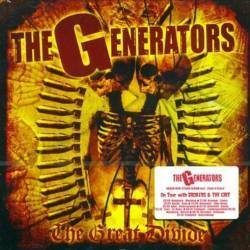 Only a few months after the re-release of the Generators’ debut album Welcome To The End, the label is back with the band’s sixth full-time CD The Great Divide. The Californians certainly don’t sound so young anymore ten years after their foundation, but their experience gives them a charm you hardly ever find in today’s punk rock bands. Ridding themselves of every imaginable punk cliché, the band plays melodic punk rock songs that remind me more than once of the divine Social Distortion. Vocalist Doug Dagger’s voice has a maturity that is so unlike the snotty performances regularly delivered by upstart bands. Never in a hurry to finish a song, The Great Divide only needs ten tracks to fill its running time, although one or two more pieces would have been welcome, especially since The Rolling Stones’ Paint It Black has this time been really covered to death. Apart from this little blemish, The Great Divide is yet another astonishing album that combines the world-weariness of a Mike Ness with the more optimistic sounding oohs and aahs of Bad Religion. With the same sunny Southern Californian background, this should not come as a surprise. It’s hard to pick any highlights, because most of the songs follow the same pattern without falling into boredom territory, as The Generators are more than able songwriters who complement the strong rhythm guitar work with enough melodies, and the slight ska elements on What I’ve Become hint at Rancid or even The Clash. The Great Divide is an album that will fill at ease in every punk collection, giving the older members of their audience the feeling that punk rock still matters, and the younger lads the hope that there is a way out of teenage angst.